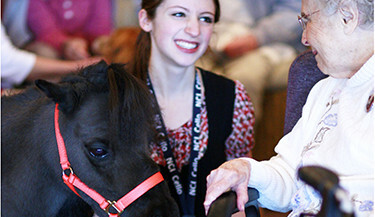 When you join the Delta Giving Society, with an annual gift of at least $1,000, you will demonstrate your commitment to the growing field of Animal-Assisted Interactions and Animal Assisted Therapy. 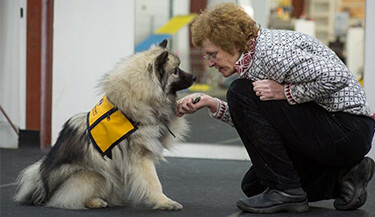 As a result of the generous support of other visionaries, Pet Partners is proud of the leadership role we have played. We will continue to lead through continuing education and online curriculum courses and webinars at no cost to our volunteers, these educational components will help provide further training to our teams so their visits can be relevant to the client’s needs from PTSD to autism, memory loss, children with cancer, children reading in school and more. As our gift to you, you will receive a Delta Giving Society pewter pin and a Certificate of Membership. You can make a gift of appreciated stock, support Pet Partners through a Donor Advised Fund, or make an outright donation. However you choose to support Pet Partners, THANK YOU! 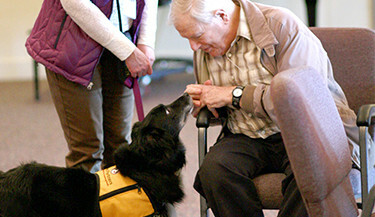 When you include Pet Partners in your will you are helping to ensure visits continue to happen through your legacy gift.Please join the many committed individuals who have made this important decision a philanthropic priority, recognizing that their estate will one day make a great difference in the lives of others. You can even support Pet Partners by shopping on the Internet, or purchasing Pet Partners items and equipment. iGive.com– Covering dozens of popular online retailers with whom you may already be shopping. Sign up and when asked to Choose A Cause, select Pet Partners. Amazon.com Smile – Add Pet Partners as your selected charity to your existing or new Amazon account and .05% of eligible purchases are donated to Pet Partners. Pet Partners Online Store – Purchase equipment and publications for Volunteers, and branded clothing items from our online store. Walk for a Dog by Wooftrax – Install the app on your phone, select Pet Partners as your charity of choice, and when you walk your dog you’ll not only track your routes and miles, but Pet Partners will receive a donation. The more people who use the app to track a walk at least once a week, the higher the donation to Pet Partners. Learn about others on our Pet Partners Pinterest page. Have you considered a gift of appreciated stock?